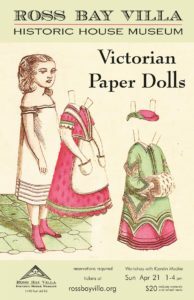 Fashion illustrations and playthings have been around for hundreds of years, but advances in printing saw an explosion of paper dolls in the 19th Century. Celebrity figures, boxed sets, and colour-it-yourself versions delighted both young and old. Following an illustrated lecture, conservator and doll enthusiast Kjerstin Mackie will help you create the kind of paper dolls Maisie and Katie Roscoe may have enjoyed at Ross Bay Villa. Children ages 8 and up and accompanied by an adult are welcome. Tickets are $20, and refreshments are included. You can purchase a ticket at http://tinyurl.com/y3gj9k77 . Alternatively, you can drop by Ross Bay Villa on Saturday between 11:00 and 2:00 to purchase a ticket. 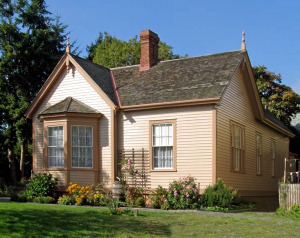 All funds raised go to the conservation, restoration and maintenance of the Ross Bay Villa Historic House Museum. Welcome to Ross Bay Villa! Ross Bay Villa was the home of Francis James Roscoe and his wife Anna Letitia from 1865 to 1879. While living there, they had five children: Mary, Katherine, Francis, Millicent and Thomas. Roscoe a prominent merchant in Victoria, was a Member of Parliament for Victoria from 1874 to 1878. Prior to becoming an MP, he was a staunch supporter of British Columbia joining Confederation in 1871. After his election, he fought for British Columbia and worked at making sure that the terms of Confederation were maintained – specifically the promised joining of British Columbia with the rest of the country by a continental railway – the Canadian Pacific Railway. Ross Bay Villa Historic House Museum has been preserved and restored to the way it would have looked when the Roscoe family were in residence. The Entry Hall; Drawing Room; and Dining Room have all been restored to the 1865-1879 appearance. A children’s room is currently under restoration. One of the three bedrooms is currently an office for the Old Cemeteries Society, which leads Sunday tours of the historic Ross Bay Cemetery, directly across the street from Ross Bay Villa. Their rental income helps to preserve the house and garden. 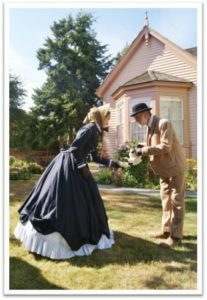 Ross Bay Villa – and the volunteer Ross Bay Villa Society that has been working to preserve and restore this rare 1865 house since 1999 – welcomes visitors. Join us for a guided tour every Saturday at 2:00.